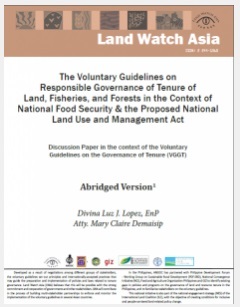 This issue brief is an abridged version of the VGGT discussion paper, “The Voluntary Guidelines on the Governance of Tenure of Land, Fisheries, and Forests in the context of National Food Security (VGGT) and the Proposed National Land Use and Management Act (NLUA)” that analyzes to what extent the salient principles and recommendations of the VGGT are substantially reflected in the National Land Use Act/NLUA (House Bill 108). FPE envisions itself as a dynamic, relevant, proactive and growing organization enabling civil society and other stakeholders towards effective biodiversity conservation and sustainable development. FPE envisions communities caring responsibly and living fully in harmony with their environment. FPE seeks to be a catalyst for biodiversity conservation and sustainable development of communities in critical sites. Land Watch Asia (LWA) is a regional campaign to ensure that access to land, agrarian reform, and sustainable development for the rural poor are addressed in national and regional development agenda. The campaign involves civil society organizations in seven countries – Bangladesh, Cambodia, India, Indonesia, Nepal, Pakistan, and the Philippines.